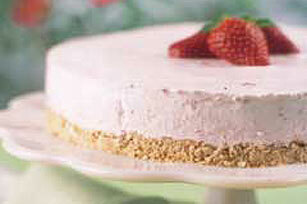 Crushed pretzels make the perfect crust for this luscious margarita-like strawberry cream pie. Note: No tequila, no triple sec required! Mix pretzels and butter; press firmly onto bottom of 9-inch springform pan. Beat cream cheese and sugar in large bowl with electric mixer on medium speed until well blended. Gradually add orange juice, beating well after each addition. Stir in crushed strawberries. Add whipped topping; stir with wire whisk until well blended. Pour over crust. Freeze several hours or until firm. Remove from freezer; let stand in refrigerator about 15 min. before cutting into 16 slices to serve. Store leftover dessert in freezer. Don't have a springform pan? Use a 9-inch round cake pan instead. Line the pan with plastic wrap before using for easy removal of the dessert from pan.